is a major economic artery with Amish buggies, semi’s, cars, and all types of motorized transportation sharing the road, with sometimes disastrous results. 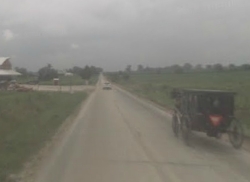 The plans call for construction of 8-foot shoulders for Amish buggy lanes along the road. The idea for separate lanes was conceived in the 1980s, but is only now coming to fruition. $2.5 million of Indiana DOT money will make it a reality, with construction starting next year. Back when they first imagined this, there were a lot fewer Amish in Daviess County. Today around 4,000 Amish live there, and Daviess County is among the ten largest Amish communities. I remember driving this road often while selling books in Daviess County some years ago. It’s blacktop, while many of the roads in the settlement are dirt. A popular auction house lies just off the road. How many buggies pass daily down this Amish avenue? Hundreds? So it’s nice to see this happening. What would be ideal, if it were possible, is to make a separate buggy lane over to the side on all of the roads, and not just in Lancaster but wherever there are Amish. That way the Amish would feel safer and alot less stressed, and we in vehicles wouldn’t have to always slow way down or be constantly on the lookout for them. But naturally, that would involve digging into someone’s property, whether private, county, or state owned, and of course the big question – who would pay for it? Daviess County is much less populated than a place like Lancaster, meaning you wouldn’t have to knock down a lot of houses to get a buggy lane through. Other Amish communities have buggy lanes running along major roads–for instance, along Route 39 in Holmes County, or State Road 5 in northern Indiana. Any other places you’ve seen them? If that is a busy area, I’m really happy for the Amish. In Holmes County OH they have some buggy lanes and it seems to make it so much nicer for the Amish to not feel the pressure of a line of cars behind them, as on the roads without the lanes. I have found them to be such considerate people on the roads, (I always hate to make them feel pressured when I’m behind them) I’m sure this makes their getting out and about that much more pleasant and safe. Coming from CA where bike lanes are everywhere, the Amish could use them for both their bikes and buggies. I think lanes for buggies is a great idea. They should have them all over. They have a special lane for BICYCLES,so why not other forms of transportation. It would most likely cut down on vehical and buggy accidents. And for the funding, shoot do a fund rasier or something. City,County,State, and those that would use the lanes,ALL could and should pitch in to help finance and do the work. Yes it would cost a fair amount of money and time, but in the long run think how many lives it would save over time. Buchanon County in Iowa is in the process of adding buggy lanes to Amish Blvd., near Hazleton, the main highway thru the Amish area. I cannot recall whether the Amish pay road taxes like the “wheel tax,” or whatever. If not, some might surely complain that it is unfair for the buggies to get a lane if their taxes do not fund road maintenance, however, I believe that this is as much a benefit to the automobile drives as the buggy drivers. Do the Amish pay the taxes that fund roads? Lattice – The answer probably varies from state to state. I have no idea what Indiana does, but in my state much of the money for county roads comes from ad valorem (property)taxes. Now, TxDot will pitch in with some funding and the road will be built either by them or under their supervision and to their specs, but the bulk of the funding will either be ad valorem or “County Road and Bridge” taxes which are also paid when you pay your property taxes. Additional local funding can come from sales taxes. If the roads in Indiana are funded in a similar fashion, then I’d say the Amish are already paying at least part of the ticket so why shouldn’t there be lanes dedicated to their use? There are buggy lanes in MN for the Amish. I saw them while back that way a few years ago. The Daviess County settlement is one of my favorite settlements to visit. Certainly a bit different than many of the other settlements. I live in Upstate New York and we have bicycle lanes on several roads and highways in our state. I think it would be a great idea for the Amish lane. If they could widen the bicyle lane or make them wider when they put more in-it would be a great Amish and bicycle lane. Lattice, I understand what you are saying, but in alot of states there are bicycle lanes and as far as I know bicycliest don’t pay taxes for there lane. And if the Amish are willing to help build and do some of the up keep then that should be enough. As others here have said, if we have bike lanes, why not buggy lanes, both for safety’s sake. I’m sure there could be compromise for funding. It’s not like this is something that needs to be done nation-wide, only in “Amish country” where horse and buggy traffic is common. Highway 60 is a four lane road. So yes, the buggies in the middle. I don’t think it lasted very long. At times MODOT has strange ideas. On another note, I’m going to Ethridge TN in Aug. Can someone recommend best place to shop and see. I read this post to my son, Mark, who is Amish. As far as the Amish paying for the roads he said it differs by state. In Indiana, for example, the Amish have to purchase a license to drive a buggy and have a license plate on the buggy. In Ohio there is no mandatory license. However, Mark said that in his community the church collects twenty-five dollars per buggy from each family in the community, yearly, and this money is sent voluntarily to the Logan County Engineer’s Office. Mark said that driving a buggy on the roads can be hair-raising. The scariest for Mark, he says, is driving on US 68 which runs north and south and splits the community in half. It is a busy road with a lot of semi-truck traffic. He said he has had trucks pass him on this two-lane road with traffic coming head on. The trucks try to squeeze past him and the oncoming traffic and roar by just inches away from the buggy. I don’t like riding in a buggy, anyway, but that would really do it for me. Mark said that some thoughtless drivers will drive past until they get up to the horse’s head and then lay on the horn to try and scare the horse. I’m just used to driving my car and puttinig it on cruise control. Mark said you can’t really relax your vigilance driving a horse and buggy. He said a horse can be startled by all kinds of things. Once they get used to going a certain road, they are uneasy if anything is different or changed about the road. A bag of trash left by the side of the road can startle them. A white plastic bag caught in a bush and flapping in the breeze. A dog, cat, rabbit, or deer suddenly runningn out in the road can be scary for a horse. Mark said, one time he was driving his horse and buggy and they came upon a field which had just had hay made and baled up into the large round hay bales. The horse saw these huge round bales and most of thought they were some kind of monsters out to attack and eat him. Little did he know that those monsters were more likely to be supper for him! Hi, Don. I think that the voluntary collection in Mark’s community is a great example and witness to others. Thanks for telling us about that. I don’t like riding in a buggy either. It scares me so much when cars come by. I never really trusted horses that much, and for no good reason, as I haven’t any bad experiences to recount. You can just tell that they get nervous at times. And they’re oh, so big. “Mark said that some thoughtless drivers will drive past until they get up to the horse’s head and then lay on the horn to try and scare the horse”. Don, people like that are not being thoughtless … thoughtless would be if they did something without thinking that caused Mark’s horse to shy. What he is describing is an INTENTIONAL act to TRY to get the horse to shy. Mark is probably too polite to say this, but I am not. Those people are just being total jerks and there is really no other way for me to see it. I have had them do the exact same thing to me, which is why I don’t take my team out on the road any more than I have to. I agree with Robin — if they put in bike lanes, they can put in buggy lanes. They need them around Hutchinson, KS, too. There have been so many terrible buggy accidents along “Yoder Road” over the years. The lanes make it easier on all traffic that uses the roads, so one group shouldn’t have to be the ones paying for it. It should just be our tax dollars at work — like any other road improvement. most go home after dark, so I think buggy lanes would be especially welcomed then. I am wondering how the shared buggy-bicycle lane works out for the bicyclist? Since they (bicyclists) would have to manuever around horse droppings, it certainly could impair their steering ability and ultimate enjoyment of the ride. Any thoughts?